Chiffon Black Dresses | Bridesmaid | Mothers dresses. 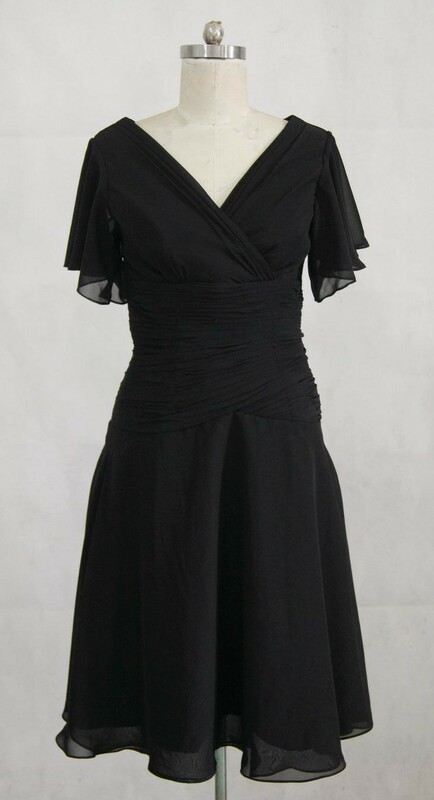 Short Black chiffon dress with v neckline, short sleeves, and ruched waistline. One piece black chiffon short dress, short sleeve, v-neckline great for bridesmaids, receptions and mother of the bride/groom. Pictures on this page are gowns created at our factory. We custom manufacture design inspired gowns which closely resemble the photographs. Each dress is similar but not exact to the original. Every dress is custom Made according to the specifications of the buyer. Important reminder: Off the rack dress sizes are NOT the same as our dresses. Please review our size charts. Bridesmaid Dress delivery is 8 weeks.